Planning ahead? It is never too soon to check out upcoming events in the Alpharetta area. Some great events coming up in February include Mardi Gras at Avalon. In celebration of Fat Tuesday, Avalon will host its fourth annual Mardi Gras Pub Crawl! Enjoy New Orleans-themed drinks and special offerings while visiting Avalon’s famed retailers and restaurants. Plus, don’t miss out on the second line band strolling the Boulevard and making it a Mardi Gras to remember! Break out your best purple, green and gold, grab beads by the handful and kick back at our Big Easy bash. Three Lifestyle Choices – One Community – Kyle Farm Has NEW PHASES Now Being Released – Choose Now! Last year was exceptional at Kyle Farm in West Cobb and many new homebuyers have chosen their homes. If you are thinking of moving soon, NOW is the time to choose your homesite and new home plan at Kyle Farm for spring move-in dates. Kyle Farm offers three lifestyle choices in one great community in those fortunate enough to call Kyle Farm Home. Whether you are looking for a one level ranch style home , a two story home or a larger luxury home, Kyle Farm has it all! Kyle Farm is now building, stop by or call 770-254-5401 to see how to get started on choosing your new home. Come let us build one for you! ACT FAST – they are offering $20K Anyway You Want It, $5K toward Closing Cost w/Preferred Lender! Contact agent for full details and requirements. Wescott by Patrick Malloy Communities announces PRE-GRAND OPENING PRICING going on now! Hurry in to tour the new model home, The Chatham, seen below. Located north of Atlanta, Wescott offers convenient commuter routes to major business hubs. Close to Lake Lanier, North Georgia Mountains, state and local parks and shopping! Nearby malls include Mall of Georgia, Northpoint Mall and Collection at Forsyth plus Sugarloaf Mills. Wescott will offer four floorplans with square footage starting over 4,100 sq. ft. Choose from multiple elevations and structural options for customizing your home to your family needs! Options include Dual Owners Site (per plan), Lofts and more. 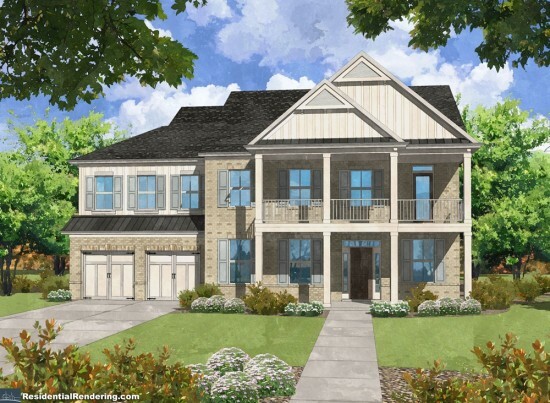 Phase I is now released for pre-sale with basement or slab homesites available. Homesites are large at one third to one half acre. Located in one of the fastest growing counties in the United States and in the sought after city of Suwanee , the amenities at Wescott include a gated community, an Opulent Clubhouse, Swimming Pool, Spa, Tennis Courts, Playground, Gazebo and an Outdoor Fire Pit Lounge. Only 61 homesites are available at Wescott, will you be one of the privileged few to call Wescott home? Forsyth County is one of the fastest growing counties in the United States and known for being one of the wealthiest counties. With low property taxes and excellent school systems draw homebuyers from all walks of life! The Chatham [shown above and below] our Master on Main home and our stunning new model home and sales center. One of the best designs for a master on main plan out there, square footage starts at 4698 and can range to over 5300! This excludes basement square feet! You will have three elevations to choose from and can option for up to six bedrooms. Stop by today to take the tour or register here to get more information. The weather is just right for indoor events. In the Cherokee County area, Reinhardt University’s Falany Performing Arts Center will fill the air with music in the next few weeks and beyond. On February 8th, enjoy Black Market Trust, an American pop/vocal jazz band whose current release “Just One of Those Things” combines the sounds of the great American crooners and vocal groups with the romantic Eastern European gypsy fire of jazz guitarist Django Reinhardt. Consisting of five world-class musicians who have traveled the globe recording and performing on the world’s biggest stages and with music’s most renowned artists, The Black Market Trust capitalize on their experience and pedigree. On February 23 at Flint Hall, come out and enjoy Così fan Tutte presented by the University Opera, Subtitled “The School for Lovers,” this beloved Mozart comedy is a probing look into romantic relationships. It starts out with a cynical philosopher’s bet that two beautiful young women can’t remain faithful to their fiancés for 24 hours. As the intrigue deepens, the young women’s affections—and those of the young men—move into a new place that’s risky and scary. The couples’ feelings reveal themselves through the sheer genius of Mozart and his brilliant librettist, Da Ponte. Così fan tutte is the epitome of sophisticated, thought-provoking entertainment. There are many events going on at Reinhardt with many being free of charge. At the beginning of a new year, especially when the weather is chilly, many look forward to the long warm days of spring and summer. Some think of making a move to a new home community and would love to have a basement but are concerned it will never get finished. It happens to the best of homebuyers, but what if you could get it finished for free? Cambridge Preserve is excited to announce their newest Buyer Incentive! ACT FAST to take advantage of a FREE PARTIALLY FINISHED BASEMENT area that is approximately a $30,000 value on basement homes or if you choose a home without a basement get $15,000 to use “ANY WAY YOU WANT IT” towards structural or design options! Hurry in to take advantage of a great buyer bonus! Get $15K “Any Way You Want It ” PLUS $5K in closing costs when you use our preferred lender*! Check with onsite sales consultant for full details. Cambridge Preserve offers resort style amenities plus private back yards [some with creeks behind them] and each and every home is built to have timeless quality and detailing. These are homes that you will be proud to invite your family and friends over for a gathering for years to come. Not sure when you want to move? Choose now and get ahead of the expected spring homebuyer crowd. Two homes will be ready to close soon and three more by the early next year so now is the perfect time for you to choose a home at Cambridge Preserve! With a limited amount of available homes in the metro Atlanta area, Cambridge Preserve is the your perfect community. When choosing a new home community, it has the power to impact your future life and the lives of your family. Where your kids go to school, what your commute is like, how you’ll spend time together with family and friends – it all influences your quality of life. Your lifestyle is paramount to your future. Choose your new home at Wescott, a luxury home collection by 2017 OBIE winner for design, Patrick Malloy Communities. Patrick Malloy Communities is a third generation home builder with over twenty years experience and the winner of consistent OBIE awards for excellence and design. Wonderfully located in Suwanee in sought after Forsyth County, Wescott exemplifies style, elegance and sophistication in a new home community. A gated community, Wescott’s proposed amenities include an Opulent Clubhouse, Swimming Pool, Spa, Tennis Courts, Playground, Gazebo and an Outdoor Fire Pit Lounge. Only 61 homesites are available at Wescott, will you be one of the privileged few to call Wescott home? The Edmonton one of our Master Up plans, a five bedroom with a guest on main. This plan offers a duel Master Option! Square footage starts at 4,243 excluding basement. The Dartmouth a Master Up plan of five bedrooms offering a guest suite on main. Your square footage starts at 4,168 excluding basement. The Hensley another Master Up with 5 bedrooms offering a guest suite on main. Options for a loft or a sixth bedroom with square footage starting at 4,450 excluding basement. The model home is now open at Wescott. Stop by today to take the tour or register here to get more information. The excitement is in the air as construction begins at West Main! Things are happening with foundations being poured and walls going up! Built by Award-Winning Patrick Malloy Communities, West Main will feature 23 impressive townhomes all within walking distance to shops, restaurants and nightlife. ACT FAST! The sales in this community have been rapid and only 3 townhomes remain in Phase 1. If you are in the market for a new townhome nestled in prime Historic Alpharetta, now is the time to choose your new home! What does this mean for homebuyers? It means that the home that you want may get sold much faster and for more than what you anticipated. This is where building or purchasing a new construction home makes so much sense. You can design it how you want it and lock in your price.